The blast occurred at a checkpoint just 500 metres (yards) from the presidential palace just as the Horn of Africa country's new prime minister unveiled his government lineup. MOGADISHU: At least five people were killed when a minibus laden with explosives blew up in Mogadishu on Tuesday, a local official said, the latest attack in the troubled Somali capital. "The vehicle was stopped at the checkpoint for security screening when it went off. 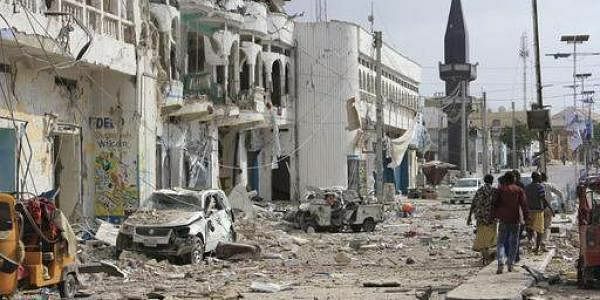 At least five people were killed including security personnel and 10 others wounded," said Abdifatah Omar Halane, spokesman for the Mogadishu administration. "The blast was so huge, I saw smoke and dust all over the area," witness Abdukadir Yusuf said. "I was on top of my house not very far away from the area, it was near the theatre and close to the presidential palace." Somalia's new Prime Minister Hassan Ali Kheyre earlier Tuesday unveiled his new cabinet, made up of 26 ministers including six women, after almost a month of political bargaining. The Al-Qaeda-linked Shabaab militant group, which is fighting to overthrow the government, has been blamed for a string of attacks in Mogadishu. The Shabaab was forced out of the capital by African Union troops in 2011 but still controls parts of the countryside and carries out attacks against government, military and civilian targets in Mogadishu and regional towns. Last week, at least five people were killed and 12 others injured in two separate car bombings in Mogadishu. "I promise that we will deal with those bloodthirsty elements with an iron fist," Kheyre said at the time. As well as insecurity, Somalia is also battling famine, with three million going hungry because of a drought that is also affecting other parts of Africa. It is the third famine in the 25 years that Somalia has been embroiled in civil war and anarchy. A 2011 famine left 260,000 people dead. Somali President Mohamed Abdullahi Mohamed, also known as Farmajo, had warned after his election in February that there would be no quick fixes for the country after decades of repeated cycles of drought and insecurity. After his nomination Kheyre -- also spelt Khaire -- promised to "tirelessly work with the president and try to form a government that represents the public". Tensions between Somali presidents and their prime ministers in recent years have frequently stymied government business and undermined political progress in the fragile nation.